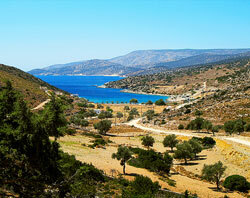 From Apeiranthos the road snakes downhill ending in Moutsouna (38 km from Hora) on the eastern side of Naxos. On our way we pass by the old emery mining area with its overhead railway tracks and wagons, used to transport the emery from the villages of Koronos down to the port of Moutsouna. When it was built in 1925, it was one of the first industrial developments in the east side, and today forms a part of the island’s recent history. 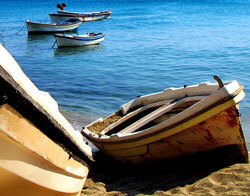 Moutsouna is a seaside settlement, with beautiful beaches. The new coastal road starts from here heading in a southerly direction and leading up to the wonderful beach of Psili Ammos and further south to Panermos. In the wider surrounding area traces of the pre prehistoric Cycladic civilization have been found.